no one has written similar functionality for lualatex. Perhaps, you could ask it as a separate question, and one of the lualatex experts will be able to answer with a solution. The basic functionality is part of luatex. For example, the following code (in luatex plain format) changes "hello" to "hi". (luatexbase-mcb)             please use luatexbase.add_to_callback instead. <\directlua >:7: in main chunk. but I could not get the code to work with luatexbase.add_to_callback either. The above plain TeX code shows that basic functionality is part of luatex and should be easily accessible in lualatex as well (once you figure out the appropriate renaming done by luacode package). Not the answer you're looking for? Browse other questions tagged luatex context ligatures or ask your own question. How can I invoke a macro inside minted inline code? 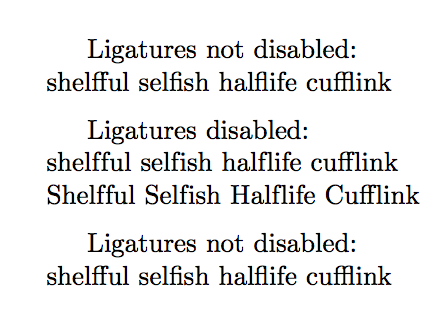 How do I know which ligatures are used in my document?